To further the goal of improving patient safety and quality in health care, three institutions – Goldfarb School of Nursing at Barnes-Jewish College, St. Louis College of Pharmacy and Washington University School of Medicine in St. Louis – created the Center for Interprofessional Practice and Education at Washington University Medical Campus in August 2015. The center is located in the new, state-of-the-art Academic and Research Building at St. Louis College of Pharmacy. 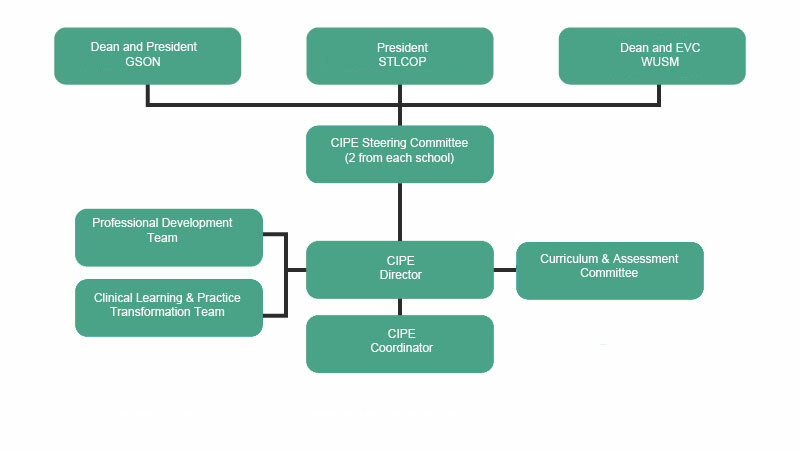 The center will enhance the ability of faculty to function as interprofessional educators, advance curricular opportunities of programs within the three schools, conduct educational research in interprofessional education, and enhance patient outcomes. Learn more about the center’s launch, accomplishments, and activities during the past year by reading our most recent Annual Report or reviewing the poster our faculty presented at the 2017 National Academies of Practice Forum. 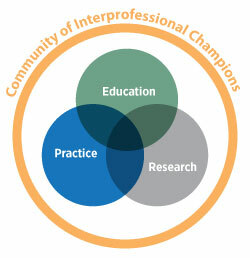 We promote an educational environment that values and supports collaboration by building a community of interprofessional champions and scholars, developing & integrating curricula, and enhancing collaborative practice. We aim to improve health and wellness of the greater St. Louis region through interprofessional care delivery, education, and community partnerships, creating a best-evidence model which can be adapted to other communities. Over the next three to five years, the center will be working to operationalize its strategic priorities. Learn more about the center’s strategic priorities. The Washington University Medical Campus consists of Washington University School of Medicine in St. Louis, Barnes-Jewish College, St. Louis Children's Hospital and the Alvin J. Siteman Cancer Center at Barnes-Jewish Hospital and Washington University School of Medicine. The medical center is located along the eastern edge of Forest Park in St. Louis’s Central West End neighborhood. It spans 164 acres over 17 city blocks. Founded in 1864, St. Louis College of Pharmacy is the region’s only independent college of pharmacy. The College is the third oldest continuously operating and 10th largest college of pharmacy in America. The student body is comprised of 1,400 students, who come from 31 states and ten countries. The College admits students directly from high school and accepts transfer students and graduates from other colleges and universities. Students at the College earn a Doctor of Pharmacy (Pharm.D.) with an integrated Bachelor of Science degree. Washington University School of Medicine’s 2,100 employed and volunteer faculty physicians are the medical staff of Barnes-Jewish and St. Louis Children’s hospitals. The School of Medicine is one of the leading medical research, teaching and patient care institutions in the nation, currently ranked sixth in the nation by U.S. News & World Report. Through its affiliations with Barnes-Jewish and St. Louis Children’s hospitals, the School of Medicine is linked to BJC HealthCare.